Community Readiness Assessment | Strategic Networks Group, Inc.
You have decided to own your digital future – but are you ready? Does your community have what it takes to address digital infrastructure and smart community needs, avoid pitfalls, and get your project across the finish line? Whether building-out broadband, digital infrastructure, or a smart community initiative, there are critical success factors for readiness and sustainability that SNG has analyzed from our extensive research, data collection, and experience with digital infrastructure projects across North America. We have developed objective metrics to assess whether communities are ready to invest in these initiatives and whether those projects will be sustainable. Elected officials, local leaders, and key stakeholders want assurance that your projects have a high chance of success and will prove to be a good investment for the community. SNG’s Community Readiness Assessment enables localities to understand if they have the right resources, skills, commitment and support to efficiently and successfully complete their projects. The assessment additionally uncovers varying perspectives across stakeholders – is there alignment, or are there gaps in perspectives and/or approach? Time, money, and political capital can be saved by identifying and addressing these gaps early in the process. Leadership Commitment of community leadership through all stages of the project. Organizational Stability Ability to follow through on the initiative over the timeframe. Community Awareness Awareness and support of citizens, businesses, and stakeholders. Implementation Ability The availability of resource capacity to follow through. Market Profile Understanding of the community of users and services demand. While a community and its leaders can go through this process on their own, too many projects have become roadkill on the information highway. Your elected officials, local leaders, and key stakeholders will want to be assured that your project is ready, your stakeholders are in alignment, and your community has what it takes to get your project across the finish line. SNG has applied our experience and methods to develop tools that helps communities achieve their digital goals more quickly and cost effectively, while avoiding pitfalls. Our Community Readiness Assessment tools are designed to easily engage community stakeholders in the process and provide a comprehensive readiness report to identify gaps and close them to get everyone on the same page, build buy-in, and avoid unanticipated issues before they happen. The Community Readiness Assessment is for multiple participants (e.g. council, leadership team), includes a report, and a one hour consultation to review and discuss findings. 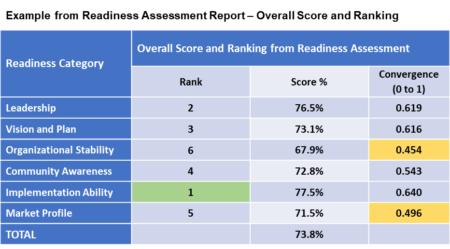 If your readiness scores indicate your community is not ‘ready’, you can take the assessment again once you have addressed identified gaps in readiness and alignment with your elected officials and local leaders. For an example of what is included in a report, see Excerpt from Broadband Readiness Assessment Report. Have your elected officials, local leaders, and key stakeholders take our easy to use Community Broadband Readiness Assessment designed for multiple community stakeholder participants. Engaging elected officials and local leaders to take the Community Broadband Readiness Assessment enables them to see whether they are in alignment and where there are gaps, with a full analysis report. This is a systematic approach to get each stakeholder ready. Furthermore, the process of engaging local stakeholders builds their buy-in to your community’s broadband initiative. 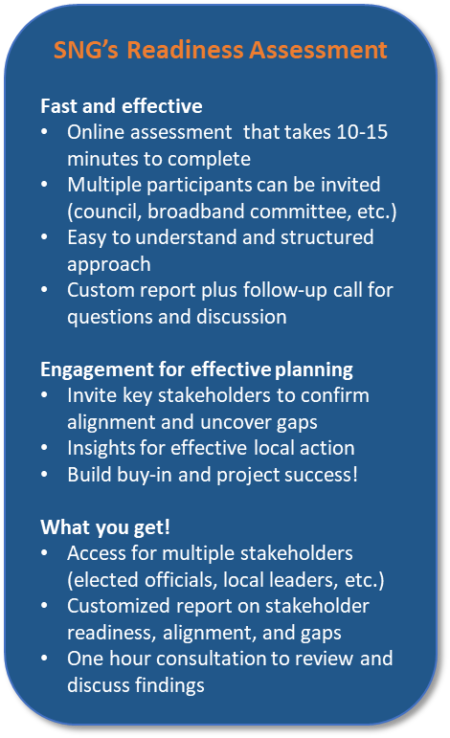 Get started with SNG’s Community Broadband Readiness Assessment to to get everyone on the same page, build buy-in, and avoid unanticipated issues before they happen. Have your elected officials, local leaders, and key stakeholders take our easy to use Smart Community readiness assessment for multiple community participants with a full analysis report. Engaging elected officials and local leaders to take the Smart Community Readiness Assessment enables them to see whether they are in alignment and where there are gaps, with a full analysis report. This is a systematic approach to get each stakeholder ready. Furthermore, the process of engaging local stakeholders builds their buy-in to your smart community initiative. Learn more about SNG’s Smart Community Readiness Assessment to to get everyone on the same page, build buy-in, and avoid unanticipated issues before they happen.